— The workshops are all levels (except for the Adv. Sunday 2/3). NO experience necessary. It is a taste of what we do in the training. — The one day intensive will be for workshop attendees that want a deeper experience and an opportunity to master the basics in their own practice but are not interested in certification. 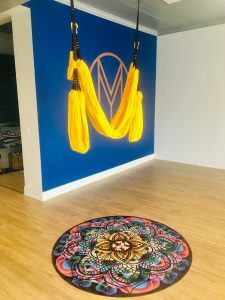 –The training is for teachers/professionals that want to get CERTIFIED to teach this style of yoga/movement therapy (workshops included in the training). You do not need to be a yoga teacher, although it is helpful to know the postures for the training. 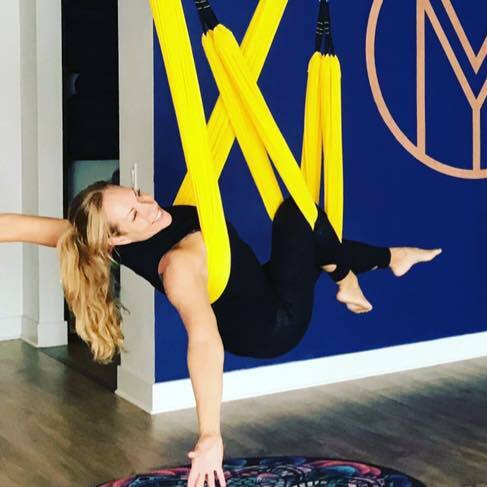 The full program will be a combo of AerialYogaPlay and AerialYogaRx for those wanting to understand the therapeutic quality of the swing practice. This is geared towards professionals who are interested in working one-on-one with clients to properly address special needs due to injury and how to heal the spine for overall health of the body as well as teaching group specialty classes. 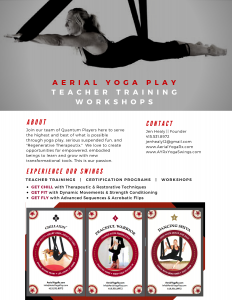 8 Dynamic and Acrobatic Sequences for more advanced movements and agility in the air (ADVANCED+ TRAINING ADD-ON ONLY). ** Program includes a certificate of completion for a total of 25 hours for CEC’s through Yoga Alliance, instruction manual, and review videos.